For many months now, I've been working on a special promotion to give away electronic copies of my bestselling conspiracy thriller The River* for free on Shortcovers.com, an offshoot of Canadian bookseller Indigo Books & Music (and Chapters & Coles bookstores). Over the next week or so, you'll see my critically acclaimed thriller advertised on Shortcovers in various ways. This free offer includes the complete novel, front and back matter too. So what's The River about? You can read The River on your computer and on various reading devices, including the iPhone. There's even an app for Shortcovers that you can download for free. Special thanks to Michael Serbinis, Michael Bowles and Ben Dugas, who have helped me get The River in front of more readers with this special, time-limited offer. *The River is currently being considered by a film director for a major motion picture. Read THE RIVER on Shortcovers.com now. 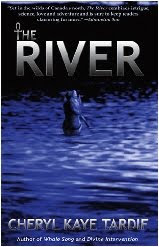 Or download the ePub version of THE RIVER, which requires the free Adobe Digital Editions download first.